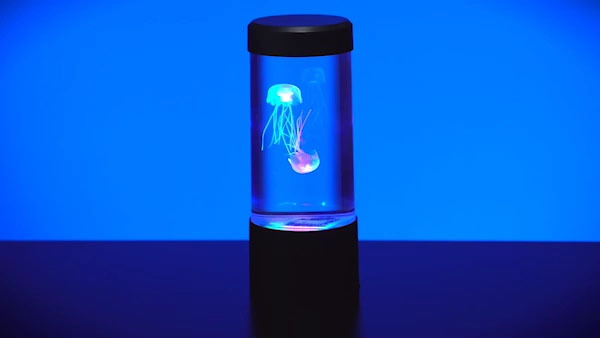 Jellyfish Lamp: Realistic jellyfish in a calming colorful tank. The Jellyfish Lamp provides the peaceful pleasure of a personal aquarium without the mess and maintenance. The translucent bodies of the two realistic jellyfish are lit by the soft glow of colored LED lights to create a fluorescent effect. 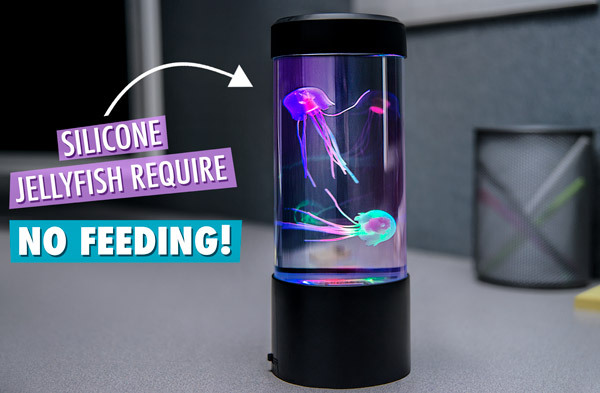 A small current inside the aquarium causes the colored creatures to dance in the water, producing a hypnotizing display that adds oceanic ambiance to your desktop. 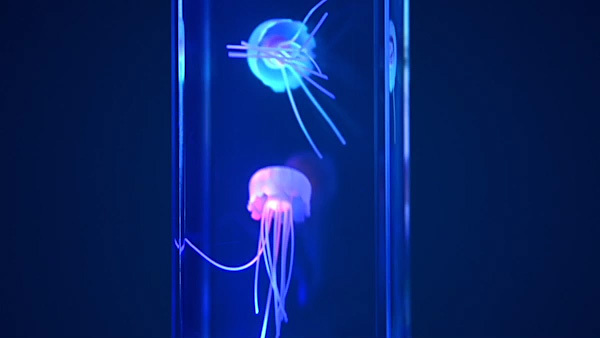 The shape of the Jellyfish Lamp was modified to a cylinder after this video was made. The aquarium is approximately the same volume. Also, the two jellyfish and LED functionality have remain unchanged. The underwater grace of marine life is a universally soothing sight, and the Jellyfish Lamp beautifully captures that calming presence. The realistic faux jellyfish float on a small water current created by a motor inside the lamp. This makes the aquatic animals pirouette in the water as three colorful LED lights illuminate them in a shimmering glow. A dose of seaside serenity. Keeping live jellyfish requires space, time, and constant care. 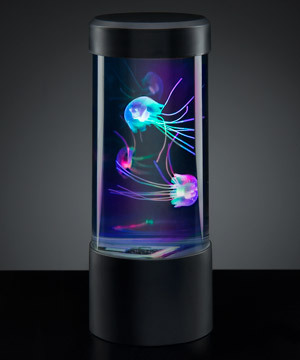 The Jellyfish Lamp replicates the colorful serenity of an aquarium without the hassle of caring for a living creature. To set up your own personal marine display, simply fill the aquarium with regular tap water, add one or two drops of liquid dishwashing detergent, and drop in the jellyfish. With no routine maintenance to worry about, all that’s left to do is turn it on to enjoy the colorful underwater dance. All the beauty, none of the sting. 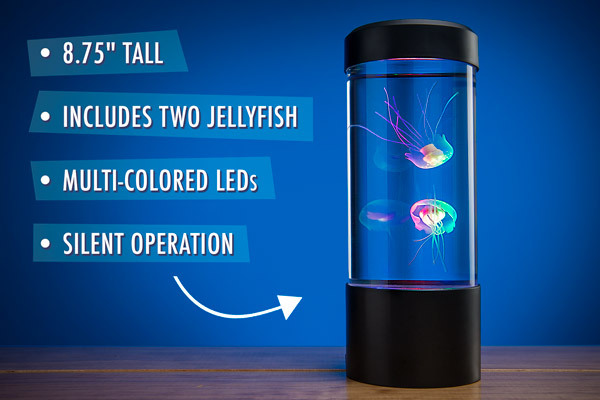 Measuring just under 9” x 3”, the Jellyfish Lamp is an unobtrusive addition to your desktop or end table. The soft lighting is provided by red, green, and blue LED lights that shine up from the bottom of the tank. The lamp includes two realistic-looking silicone jellyfish with translucent bodies, colored centers, and thin tentacles. The lamp’s motor operates with a nearly-imperceptible whirl, so as not to distract from your new soothing decor. Your friends will be jelly of your new desktop decoration. Question: Does the lamp continually run? Answer: The Jellyfish Lamp has an on/off switch. The lights and water current will only function when the lamp is turned on. When the lamp is off, the jellyfish will stay suspended in a stationary position. Question: Will I need to change out the water? Answer: The manufacturer recommends occasionally changing the water if it gets dirty. This will be much less frequent than if you had a real aquarium.